SHSU organized SPRING 2018 WHITE COAT CEREMONY at Spartan Campus, Vieux Fort on January 21st, 2018 at 6:30 pm. Dr. William Ayers President of SHSH was the guest speaker for the evening. He wished all new Students a bright future as Physician and to maintain the highest standards and quality of Medical Education. Dr. Mufutau Yekeen Assistant Director of Student Affairs lead new medical students to read the Hippocratic Oath as a pledge to show their allegiance to right knowledge, ethics and future practice of Medicine. 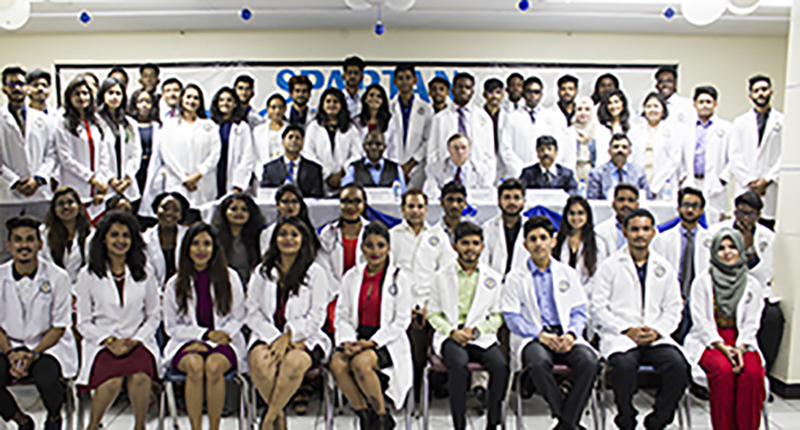 Spartan University wishes all the New Medical and Premed students to work hard at their goal of becoming a physician.